I made this card for one of our SCS stamper friends, Shannan Teubner, who lost her husband unexpectedly last weekend. 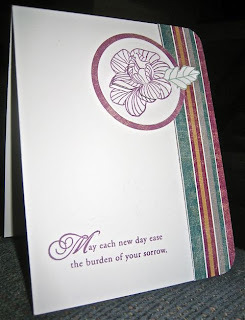 I like this clean and uncluttered design for a sympathy card. The flower was stamped twice, one was cut out with a Nestability. I cut only the middle portion of the second image and popped it up with foam tape on the first image for dimension. I also stamped and cut out the leaf. I chose these colors for Sharon Johnson's Stamp Simply 126- to use purple and green. This is very nice. I struggled with making a sympathy card today. Wish I had your inspiration, but alas, it is now done and will post on Saturday on my blog. What a sad event. This is a lovely card that I'm sure will bring Shannan some comfort.